The aparthotel boasts attractive and spacious studios that make your stay a more comfortable and pleasant one. It also has excellent public transport connections with the centre of Barcelona. 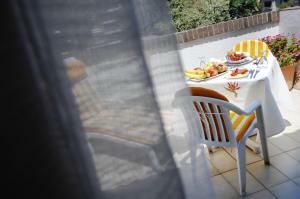 Aparthotel Bonanova offers 24-hour reception, a tour desk and shuttle service at an extra cost. Guests can have complimentary coffee, tea and pastries in the morning or pastries. Alternative continental breakfast is available upon request at a cost. El Putxet Train Station is 4 minutes' walk away and Gaudi's Park Güell is a 30-minute walk away. Please note that the parking is suitable only for small cars. Please note, a safe is available at a 1.94 € per day. For non-refundable reservations, you must confirm your credit card details via a secure link. Aparthotel Bonanova will send you the link by email after you have made a reservation. Air-conditioned studio with a safe, TV and minibar. There is a kitchenette with a fridge and microwave. The private bathroom comes with a hairdryer. Daily cleaning is provided. Rate: € 55.20 ... € 119.00; select dates below to get current rates. Air-conditioned studio with a sofa bed, safe, TV and minibar. There is a kitchenette with a fridge and microwave. The private bathroom comes with a hairdryer. Daily cleaning is provided.